Carol Bakhos is Professor of Late Antique Judaism and Jewish Studies at UCLA. Since 2012 she has served as Chair of the Study of Religion program and Director of the Center for the Study of Religion at UCLA. Her publications include The Family of Abraham : Jewish, Christian and Muslim Interpretations (Harvard University Press, 2014) and The Talmud in Its Iranian Context (Mohr Siebeck, 2010). Michael A. Cook is Professor of Near Eastern Studies at Princeton University. His publications include The Koran : A Very Short Introduction (OUP, 2000) and Ancient Religions, Modern Politics : The Islamic Case in Comparative Perspective (PUP, 2014). 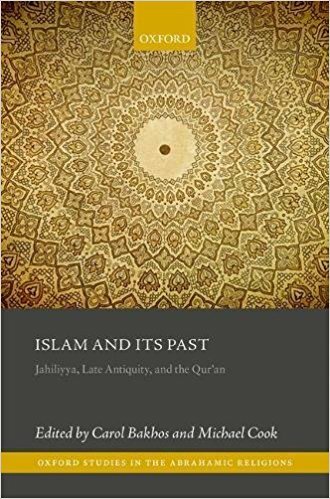 Islam and Its Past : Jāhiliyya, Late Antiquity, and the Qur’an brings together scholars from various disciplines and fields to consider Islamic revelation, with particular focus on the Qur’an. The collection provides a wide-ranging survey of the development and current state of Qur’anic studies in the Western academy. It shows how interest in the field has recently grown, how the ways in which it is cultivated have changed, how it has ramified, and how difficult it now is for any one scholar to keep abreast of it. Chapters explore the milieu in which the Meccan component of the Qur’an made its appearance. The general question is what we can say about that milieu by combining a careful reading of the relevant parts of the Qur’an with what we know about the religious trends of Late Antiquity in Arabia and elsewhere. More specifically, the issue is what we can learn in this way about the manner in which the ’polytheists’ of the Qur’an related to the Jewish and Christian traditions : were they Godfearers in the sense familiar from the study of ancient Judaism ? It looks at the Qur’an as a text of Late Antiquity-not just considering those features of it that could be seen as normal in that context, but also identifying what is innovative about it against the Late Antique background. Here the focus is on the ’believers’ rather than the ’polytheists’. The volume also engages in different ways with notions of monotheism in pre-Islamic Arabia. This collection provides a broad survey of what has been happening in the field and concrete illustrations of some of the more innovative lines of research that have recently been pursued. 6 : Were there Prophets in the Jahiliyya ?